Metal roofs come in two basic categories: structural and architectural. Structural metal roof installations combine the waterproofing layer and the supporting deck. In architectural installations, the two are separate components. Corrosion. All types of metal roofs are subject to corrosion from exposure to a combination of water and water-borne pollutants. Protective coatings help to limit the exposure and damage. Any damage to the coating exposes the underlying metal to the elements and accelerates the corrosion process. Failed fasteners. Metal roof fasteners are subject to a range of forces that can reduce their effectiveness, including corrosion, wind-induced vibrations, and metal fatigue. If a sufficient number of fasteners fail or even loosen, wind can lift the panels and separate them from the roof. Workers should replace any failed or damaged fastener. Failed seams. Seams on metal roofs can be flush with the roof’s surface, or they can be raised. Any separation of the seam can result in water penetration and increase the risk the wind will lift panels from the roof. 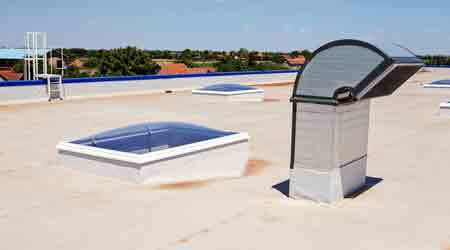 Workers must repair all seam deficiencies in order to prevent further damage to the roof. James Piper, P.E., is a national consultant based in Bowie, Md., with more than 25 years of experience with facilities maintenance and engineering issues.